I don't believe everything I read. However, I do think it is good manners to ask a recycling center employee for permission to take something, even if it is about to be crushed under a front bucket loader anyway. Sometimes when you have good manners, good things happen. It's truly a nice bike that represents all of the great things a 12-speed of that era represents...whatever those great things are. All I know is in those days, you'd have to take your hands off the handlebars to change gears. Sometimes, 'rescue bikes' tell a story. Given the presence of the Cannondale seat bag (which isn't known for its aerodynamic qualities) this bike may have been owned by a person I would have enjoyed riding with. At first I couldn't tell why the person would have thrown the bike away. 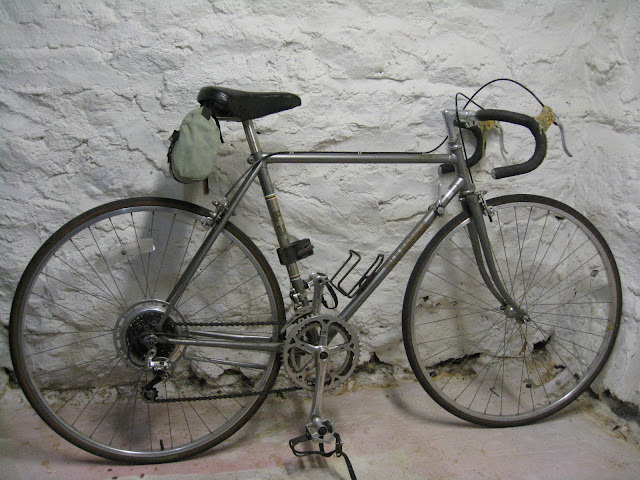 However, at some point in this Fuji Espree's life, the brakes became loose and the previous owner, as far as I can tell, tried to seal them back on with baked macaroni and cheese. While I was writing this post, I asked my wife if she had ever photographed the excellent macaroni and cheese she makes with jalapeno peppers and whole wheat pasta. She said no, so I can't post a picture here to give you the proper comparative analysis, but trust me: it looks like baked macaroni and cheese. Riding an old 12-speed with at least three servings of pasta caked on the handlebars didn't appeal to me. But the 27" rear wheel caught my eye. As I mentioned before, my recumbent dates back to Reagan's first term and is a challenge to find parts for. It takes a 16" front wheel and a "27 rear wheel. The 27" wheel that was on the recumbent had developed a bad wobble in the axle, which was the result of a bizarre incident that had all the damage of an accident: coasting down the huge hill on Rt. 1 by Brasita's, I shifted into a low gear for the next stop and the chain jumped and got wedged between the cassette and the spokes, locking the wheel in place with such force that it broke two of the chain links. Skilled cyclist that I am, I kept the bike under control and skidded - well over 100 feet - to a noisy stop right near Blockbuster video, just next to a bus shelter. The man in the shelter gaped at me as I got off the bike and carried it to the sidewalk. "That ever happen to you?" I asked him. After walking the crippled bike home, I retrued the wheel and fixed the chain, but the wobble just wouldn't go away and eventually got worse. When I turned the Fuji Espree upside-down, the 27" wheel spun easily and there wasn't a wobble. I knew exactly what I needed to do. 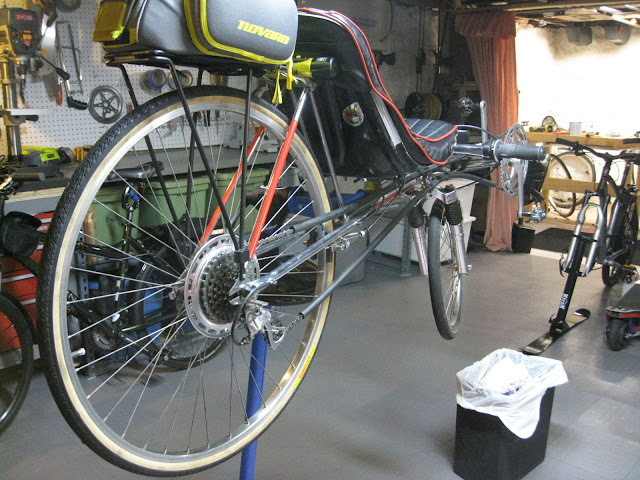 In my first post I mentioned that it once took three bike shop employees to replace the wheel in the recumbent. I had the talent of three men in the shop, because I did it by myself (it took some time and unconventional tools, but it was done). I did discover that I needed to put a spacer in place so I could tighten the wheel. Since I had no washers, I used - as you can see in the photo - an L-bracket I had lying around. I reasoned I could saw off the extra bit later. As a bonus, the Fuji Espirit wheel has an aluminum ring between the cassette and the spokes, so my days of worrying the chain would jump to its death once again are over! I dismantled the rest of the Espree, putting some parts away for future projects. I did throw away the handlebars, but was grateful that in death, that bike had saved the life of another. 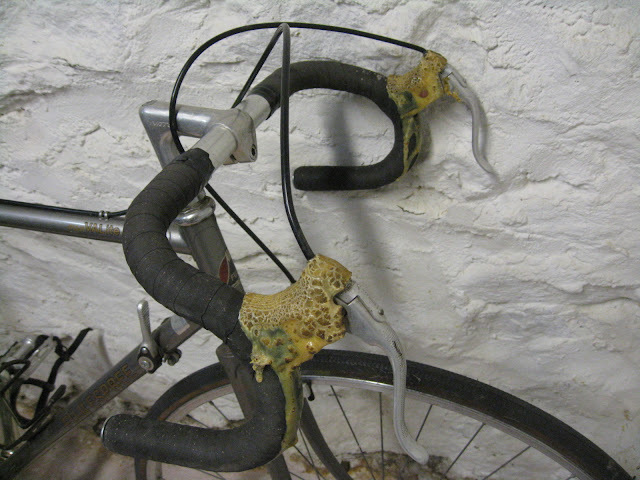 If you wish to contribute an unwanted bike to the Saved From The Scrapheap series, please contact me anytime. 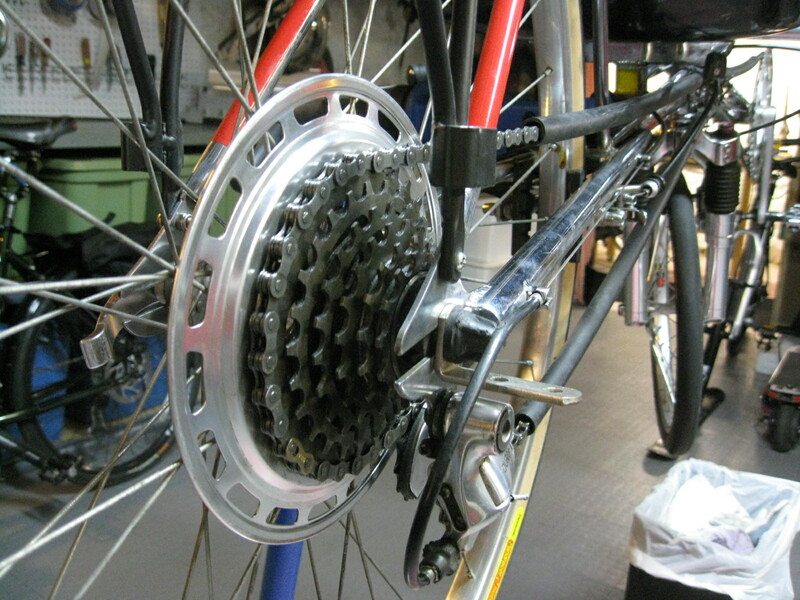 I have kept the "dork disk" (spoke protector) on my 1973 Dawes Galaxy precisely to avoid the scenario you describe. I think it is worth the extra ounce or whatever. Now if I could just remember not to run into parked cars! Do you still have the crank arms? I am in need of a left crank arm for a 1984 Espree - it says Shimano GT on it.